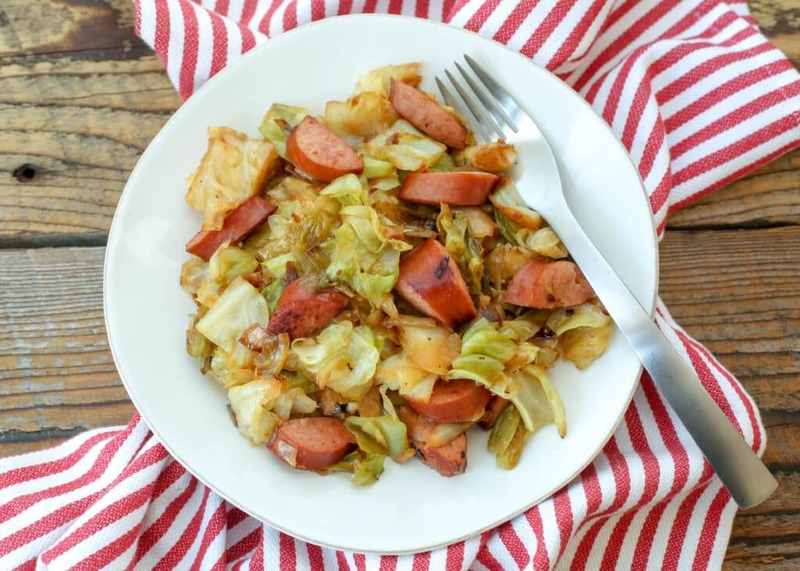 Cabbage and sausage are truly a perfect match and never more so than when fried together in this Cabbage and Sausage Skillet. I’ve made endless dishes combining these two ingredients, but when I saw this simple recipe inside my friend Gina’s new cookbook, One and Done, I knew it needed to happen soon. This dish highlights everything delicious about these two ingredients without adding much more to the dish. It’s cabbage and sausage in their simplest most flavorful state. As a bonus, this skillet meal is easy to throw together without much notice making it perfect for a busy weeknight dinner. Nothing special is required to make this recipe. Start with cabbage and sausage, then chop an onion, add a little garlic, salt, pepper, and a tiny splash of vinegar. You’ll be done cooking dinner in hardly any time at all and meal will be delicious. What is it about the combination of cabbage and sausage? These two ingredients compliment each other so wonderfully, it hardly matters what else is combined with them. 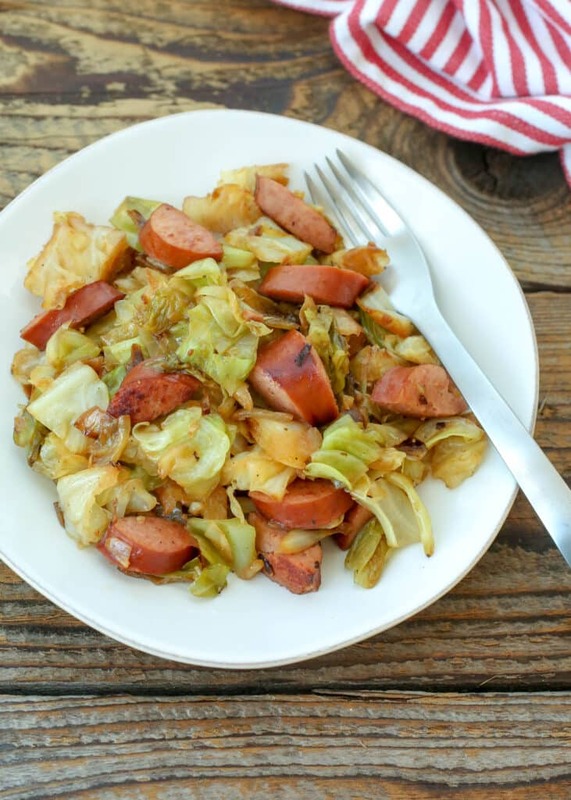 Salty, smoky sausage, with tender sauteed cabbage, is a guaranteed win with my family. While raw cabbage has very little flavor on its own and can even be a little bitter or peppery, cooked cabbage tastes sweeter and it picks up additional flavors from the foods you cook with it–for example, sausage. When these two ingredients are cooked together the result is a meal that everyone in my family requests again and again. I like it so much that I’ve lost count of all the recipes I’ve made that contain some combination of cabbage and sausage. I love a good baked cabbage recipe like Layered Cabbage Rolls and you’ll never hear me complain about a soup with cabbage simmered to tender sweet perfection like in this Mexican White Bean and Cabbage Soup recipe. But pan fried cabbage and sausage? That’s what I find myself craving most when I want to cook sausage and cabbage together. 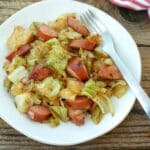 This fried sausage and cabbage recipe starts by browning kielbasa sausage in a skillet with just a tiny bit of oil. Once the meat is cooked, onion and cabbage are pan fried with nothing more than salt, pepper and garlic. A splash of red wine vinegar adds a tang to the meat and vegetables bringing the whole dish together. If you’ve been reading here for any length of time you know that I’m not usually shy about adding spices and herbs to my recipes. Sometimes, though, you just want the unadulterated taste of the cabbage and sausage without any extras. Kielbasa is plenty spicy all on its own and I can’t imagine a better combination for a simple skillet dinner. Kielbasa recipes are my go-to meals for quick and easy dinners. It’s a rare day when you won’t find a kielbasa sausage waiting to be used in my refrigerator. The convenience factor cannot be beaten. I tend to pick up a few kielbasa sausages at a time and use them in our favorite recipes. These Herbed Potatoes with Kielbasa and Corn have been one of my go-to easy dinner recipe for years. 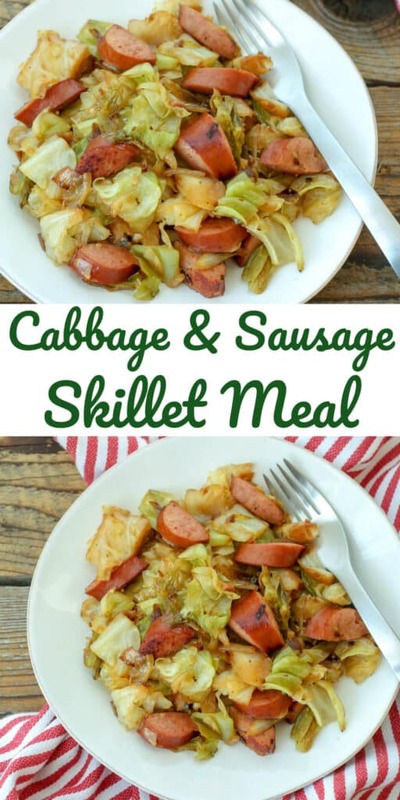 Try this Skillet Mexican Street Corn with Kielbasa or this Kielbasa Cabbage and Potato Skillet for something a little different. Kielbasa and Shrimp Fried Rice is a hearty meal that my whole family enjoys. And if you have a green chile lover in your life, you’ll want to try this Garlicky Potato, Kielbasa, and Green Chile Skillet. If you love sheet pan meals as much as I do, you’ll want to try this Kielbasa and Pierogies Sheet Pan Dinner. This Asparagus Kielbasa Bow Tie Pasta is another great way to use sausage for an easy dinner. Halve the kielbasa lengthwise and then slice it into 1/2-inch pieces. Heat a large deep skillet or dutch oven over medium heat. Add 1/2 tablespoon oil and the kielbasa. Toss to coat and then cook until browned, about 3 minutes per side. Transfer the kielbasa to a plate. Return the pan to the stove and reduce the heat to medium-low. Add the remaining tablespoon of oil and the onion. Cook, stirring occasionally until the onion has softened. Add the garlic, cabbage, salt, and pepper. Toss well to combine. Cover and cook, stirring every 4-5 minutes until the cabbage is wilted, about 12 minutes. Stir in the vinegar and return the kielbasa to the pot. Stir and cover for about 3 more minutes, until the cabbage is tender and the kielbasa is hot. Taste and add salt, if needed. Serve warm. 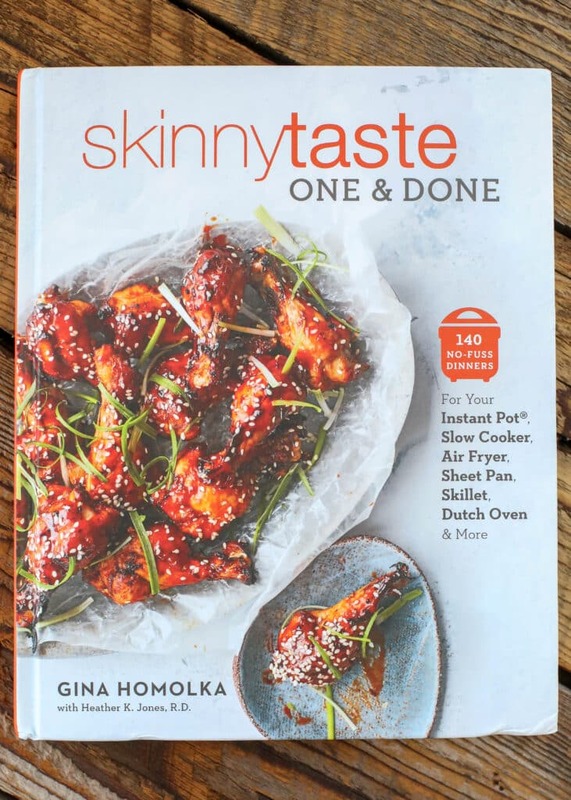 If you don’t already have it, I recommend picking up Gina’s One and Done cookbook! 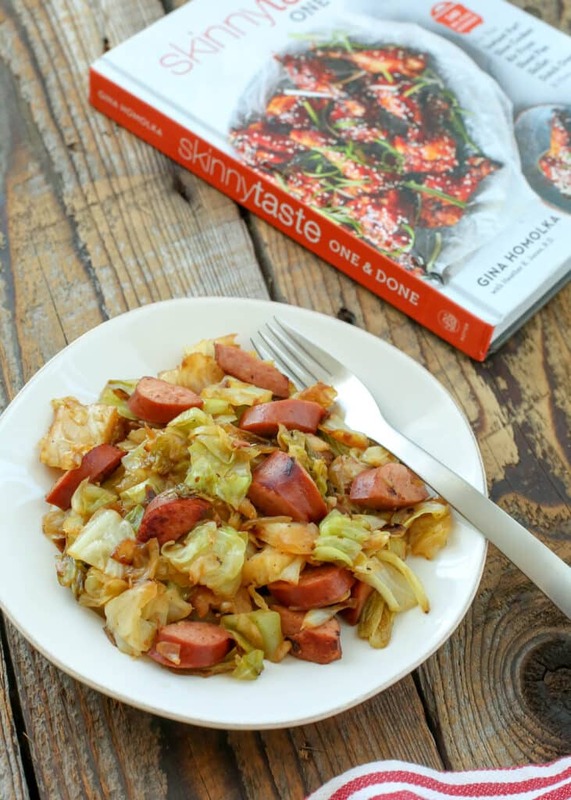 Cabbage and sausage are a perfect match and you're going to love this one skillet meal. Halve the kielbasa lengthwise and then slice it into 1/2-inch pieces. Heat a large deep skillet or dutch oven over medium heat. Add 1/2 tablespoon oil and the kielbasa. Toss to coat and then cook until browned, about 3 minutes per side. Transfer the kielbasa to a plate. Return the pan to the stove and reduce the heat to medium low. Add the remaining tablespoon of oil and the onion. Cook, stirring occasionally, until the onion has softened. Add the garlic, cabbage, salt, and pepper. Toss well to combine. Cover and cook, stirring every 4-5 minutes until the cabbage is wilted, about 12 minutes. Stir in the vinegar and return the kielbasa to the pot. Stir and cover for about 3 more minutes, until the cabbage is tender and the kielbasa is hot. Taste and add salt, if needed. Enjoy! The original recipe is written with turkey sausage. If that's your preference, it will work nicely in this recipe. My family prefers traditional kielbasa, so that is our choice for this dish.